Get ready to style, snap and share your way to victory in this year's #MyBrickHome design contest. 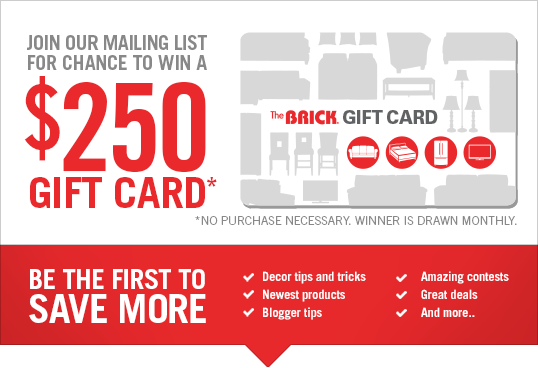 The top prize is a $36,000 Brick shopping spree, while monthly winners each receive a $1,000 Brick gift card. 1. Style Brick products in your home or in our stores. 2. Snap a great pic! To be eligible to enter, you must be the age of majority in your province of residence. You are not eligible if, during the Entry Period, you are an employee or partner of The Brick or FKA Inc. or a member of the immediate family (defined as mother, father, brother, sisters, sons, daughters and husband or wife, regardless of where they reside) or household of any of the above persons, their respective affiliates, agents, licensors, associates, representatives and advertising agencies. If an individual meets the aforementioned requirements then they will be considered an “Eligible Entrant” for the purposes of this Contest. All decisions regarding eligibility to enter this Contest will be determined by The Brick in its sole discretion. This Contest is void where prohibited by law. The Prizes are described in paragraph 9 below. The chances of winning a Monthly Prize will depend on the number of Entries received that month in accordance with these Official Rules and the cumulative number of Entries received during the entire Contest Period for the Grand Prize. This Contest commences on 12:00AM ET on March 22, 2019 to 11:59:59 PM ET on December 31, 2019 (the “Contest Period”). Eligible Entrants must take a photo of a Brick product. Anyone who has access to a Brick product may enter. This may include having a Brick product in their home at any time, having access to Brick product in a friend or family member's home, having access to Brick product in a Brick store, and/or having access to Brick product in other locations. The style and quality of your picture really does matter so make your Entry look as good as possible. Use accessories to add “pizzazz” to the space and product to give it that “WOW” factor. Share your photo on Instagram with the hashtag “#MyBrickHome" and tag The Brick (@brickwarehouse). Each completed and correctly tagged picture is an “Entry”. All Entries must be received before the end of the business day (11:59pm ET time) of the current month. The Entry must not defame, misrepresent or contain disparaging remarks about The Brick or any of its products, or other people, products or companies or communicate messages inconsistent with the positive images and/or goodwill associated with The Brick, as determined by The Brick in its sole discretion. The Entry must be suitable for family audiences, including without limitation for display and publication on packaging and national television, as determined by The Brick in its sole discretion. The Entry must not contain any content that is or contains: unlawful behaviour, profanity, explicit sexuality, harmful, threatening, abusive, harassing, tortious, defamatory, vulgar, obscene, libelous, or is hatefully, racially, ethnically or otherwise offensive or objectionable, as determined by The Brick in its sole discretion. The Entry must not infringe on the intellectual property rights, or defame or invade the publicity or privacy rights, of any third party, living or deceased. By submitting an Entry, you warrant and represent that: (i) the Entry is your original work, created solely by you, and over which you have all necessary rights, title and interest, including copyright; (ii) the Entry has not been previously published; (iii) the Entry does not infringe upon the intellectual property rights, or defame or invade the publicity or privacy rights, of any third party, living or deceased; (iv) all individuals appearing the Entry (or, in the case of a minor, the parent or legal guardian of such an individual) have granted to you an irrevocable, royalty-free, worldwide license in perpetuity to publish or otherwise use their likeness in the Entry in any manner and media whether now known or hereafter devised including, without limitation, on the Contest Websites (www.mybrickhome.ca/contest) and in The Brick's promotional material; and, (v) that the Entry complies with the Submissions Guidelines. You agree to indemnify and hold harmless The Brick from any claims to the contrary. By entering, you agree as follows: (i) you acknowledge that your Entry may be posted by The Brick on the Contest Websites or used in The Brick’s promotional material, in The Brick's sole discretion but without obligation; (ii) you have the right and authority to, and do hereby, grant to The Brick an irrevocable, non-exclusive, royalty-free worldwide license in perpetuity to reproduce, store, copy, broadcast, display, distribute, edit, alter, combine with other material, publish, post, commercialize and/or otherwise use without limitation all or any part of the Entry on the Contest Websites or in The Brick’s promotional material; (iii) you waive any and all moral rights that you may have in and to the Entry with respect to the uses contemplated herein; and, (iv) you agree to release and hold harmless The Brick from and against any and all claims based on publicity rights, defamation, invasion of privacy, copyright infringement, trade-mark infringement or any other intellectual property related cause of action that relates in any way to The Brick’s use of the Entry. The top five (5) photos each month will be selected by Brick style experts. From those photos, one (1) winner and one (1) runner up Entry will be randomly drawn no later than five (5) business days after the end of each month. All decisions made by The Brick in this regard are final and binding and cannot be challenged. Grand prize winner to be determined by a random draw of all cumulative monthly eligible Entries at 1:00pm ET on January 2, 2020 at 16930 114 Avenue NW, Edmonton, AB, T5M 3S2. Entries received during each month will not be carried forward as an Entry for subsequent months, with the exception of the Grand Prize draw where all admissible Entries received will be eligible to win the Grand Prize. The Selected Entrant executes a release and waiver within forty-eight (48) hours of being notified by The Brick. If necessary, should the Prize be unclaimed, or should the Selected Entrant be unwilling, unable or ineligible to win the Prize as set out in these Official Rules, the Prize will be forfeited and The Brick shall have the right to contact the runner up Entry (“Alternate Entrant”). The Alternate Entrant will be contacted following the same method as set out above. The Prize will be mailed to each winner at the address provided by the winner on the release and waiver. The winner will receive a blank gift card and a letter with instructions on how to have the Brick card loaded with the appropriate prize amount. It is the responsibility of the winner to contact The Brick to have the gift card loaded. Should the winner not contact The Brick to have the gift card loaded within six (6) months of winning the Prize, that winner will forfeit their Prize. There are a total of 10 prizes to be won during the Contest Period, being one (1) prize every month for each month over the Contest Period, and 1 Grand Prize at the end of the Contest Period. The total value of all Prizes awarded during the Contest Period is $45,000. The Prize is not transferable and must be accepted as awarded with no substitutions, except at The Brick’s sole discretion. The Brick is not responsible for any printing, distribution, production or other errors which may occur in the course of the conduct of the Contest including, without limitation, any typographical, printing or other errors in the Official Rules or in or on any other materials relating to the Contest, and The Brick is not responsible for any errors or losses which may occur in respect to the Prize selection, or in respect to the receipt, transfer or storage of Entries. The Brick may rescind, cancel, amend or revoke the Contest, without liability, and in its sole discretion for any reason whatever. Without limiting the generality of the foregoing, The Brick reserves the right to cancel or modify the Contest and/or the Official Rules, in whole or part and without notice, if The Brick determines, in its sole and absolute discretion, that fraud or technical or other failures have threatened or destroyed the integrity of the Contest. If, for any reason, the Contest is not capable of running as planned, due to causes beyond the reasonable control of The Brick which corrupt or affect the administration, security, fairness, integrity or proper conduct of this Contest, The Brick reserves the right, in its sole discretion to cancel, terminate, modify or suspend the Contest. Participation in this Contest constitutes an agreement by each Entrant to comply with these Official Rules. By entering the Contest, each Entrant: (a) releases and holds harmless The Brick and its directors, officers, employees, parent companies, subsidiaries, affiliates, suppliers, sponsors and agents from any and all liability for injuries, loss or damage of any kind to persons, including death, or property damage, resulting in whole or in part, directly or indirectly, from acceptance, possession, use or misuse of any Prize, participation in this Contest, or participation in any Prize-related activity; and (b) agrees to fully indemnify The Brick and its directors, officers, employees, parent companies, subsidiaries, affiliates, suppliers, and agents from any and all claims on the part of any third party or parties related in any way and for any reason to the Contest or to the Prize including, without limitation, death, or personal or property damage or injury. The Brick assumes no responsibility or liability for incorrect, damaged, illegible, mutilated, spoiled, destroyed, stolen, misplaced, lost, late, misdirected or incomplete Entries, notifications, responses, replies, or for any computer, online, telephone, hardware, software or technical malfunctions that may occur (including but not limited to malfunctions that may affect the transmission or non-transmission of an Entry). The Brick is not responsible for any incorrect or inaccurate information, whether caused by website users or by any of the equipment or programming associated with or used in the Contest or by any technical or human error which may occur in the processing of Entries. The Brick assumes no responsibility for any error, omission, interruption, deletion, defect, delay in operation or transmission, communications line failure, theft or destruction or unauthorized access to, or alteration of, Entries. The Brick is not responsible for any problems, failures or technical malfunction of any telephone network or lines, computer online systems, servers, providers, computer equipment, software, e-mail, players, or browsers, on account of technical problems or traffic congestion on the Internet, at any website, or on account of any combination of the foregoing. The Brick is not responsible for any injury or damage to Entrants or to any computer related to or resulting from participating or downloading materials in this Contest. If, for any reason, the Contest is not capable of running as planned, including infection by computer virus, bugs, tampering, unauthorized intervention, fraud, technical failures, or any other causes beyond the control of The Brick which corrupt or affect the administration, security, fairness, integrity or proper conduct of this Contest, The Brick reserves the right at its sole discretion to cancel, terminate, modify or suspend the Contest. By entering this Contest and accepting the Prize, each Eligible Entrant whose Entry is selected hereby grants to The Brick, without further compensation, the unrestricted rights to publish, in the collective or individual discretion of The Brick, the name, picture, portrait, likeness, voice and ideas of that Eligible Entrant for advertising and promotional purposes. These are the official Contest rules. This Contest is subject to all applicable federal, provincial and municipal laws and regulations. These Contest rules are subject to change without notice in order to comply with any applicable federal, provincial and municipal laws or the policy of any other entity having jurisdiction over The Brick. The invalidity or unenforceability of any provision of these Official Rules shall not affect the validity or enforceability of any other provision. In the event that any provision is determined to be invalid or otherwise unenforceable or illegal, these Official Rules shall otherwise remain in effect and be construed in accordance with their terms as if the invalid or illegal provision were not contained in these Official Rules.